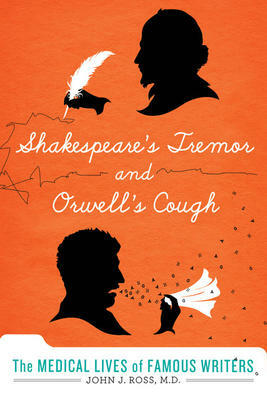 “Shakespeare’s Tremor and Orwell’s Cough” by John J. Ross, M.D. This is a provocative little book by a Boston doctor who examines the illnesses and deaths of ten famous English writers. John J. Ross is a physician at Brigham and Women’s Hospital in Boston and an assistant professor of medicine at Harvard Medical School. He has a deep love for the literary output of these writers, and concern for what they suffered at a time before vaccinations, sterilized scalpels, or real drug regimens. He begins with Shakespeare who died in l6l6 at the age of 52. Since writing Hamlet (l600) he had struggled with heavy body shaking that finally made it impossible for him to write. Was this essential tremor, or mercury poisoning? He had lived in London away from his wife, in Stratford, and never got over the death of his only son. The Bronte sisters led dreary, lonely lives in a remote town in Yorkshire, attending a repressive school, the Clergy Daughters’ School in l825, before getting tuberculosis. It is an altogether sensitive and thoughtful book.